Margo Grant Walsh began collecting silver on a whim, but she soon embraced the design of silver and metalwork objects with vigor. Not being a scholar, she became a self-educated collector. Starting modestly and relying on museums, exhibitions, books, antique shows, flea markets and dealers, she now has a world class collection of some of the finest silver from both the most famous and some of the most obscure artisans of the 20th century. Walsh has a global metalwork collection from 21 countries. As she explains it, we now truly, “live in a global world,” and it is fitting to celebrate the great objects, all of which are functional, that were fashioned during the 20th century. 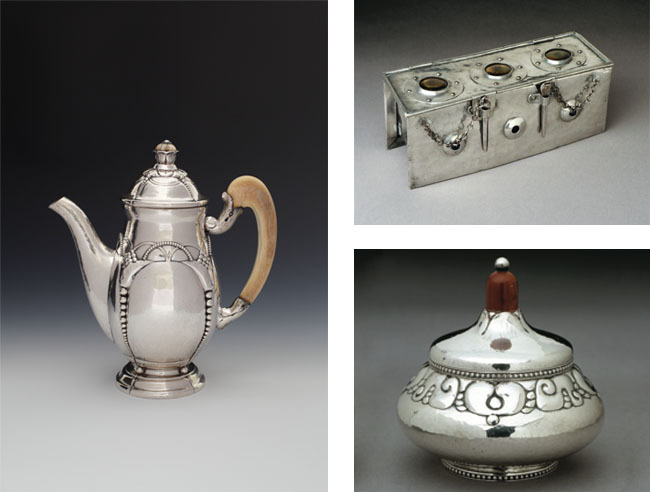 This selection from Walsh’s larger collection highlights silver and metalwork from Scandinavia, Great Britain, Europe and the United States, including a more specific focus on Native American work from the southwest U.S. and Mexico. While showcasing work from a wide range of geographic regions, the craftsmanship, intricacy and detail of the works remain a constant focus. Funded in part by Roy and Caryl Cline, FMC Corporation, the National Advisory Board of the UW Art Museum Endowment, the National Advisory Board of the UW Art Museum, and Wyoming Public Radio. Margo Grant Walsh discusses "Silver and Metalwork of the 20th Century: The Margo Grant Walsh Collection" on view at the University of Wyoming Art Museum, July 23 - Nov. 12, 2011.